Friday, March 11th, is your last chance to hear CSU’s Wurlitzer Organ in action. The 84 year-old organ, originally designed to provide the sound of a 40-piece orchestra for silent films, has been at the university since 1983. Visit CSU’s Calendar of Events for full details. Valentine’s Day – Science Style! Just in time for Valentine’s Day, why not send your sweetie a science-based card to show your love? Find more science valentines here, here and here. If you want to do something a little craftier, try folding a 3-D heart valentine. And if a paper heart just isn’t enough to show your affections, be sure to stop by the museum this Saturday for our Valentine’s Day Heartbreaker: Heart Dissections program. After all, nothing quite says “love” like dissecting a pig heart together! The Valentine’s Day Heartbreaker: Heart Dissections program will happen Saturday, February 12, from 11:00 am – 2:00 pm at the Fort Collins Museum & Discovery Science Center. It’s no secret that the museum staff has its fair share of Harry Potter fans. That’s why we’re thrilled to learn that Potter star Daniel Radcliffe is not only a fan of Tom Lehrer (another favorite of certain staff members) but choose to perform Lehrer’s famous chemistry song, “The Elements,” on a recent talk show appearance. Harry Potter singing the Periodic Table – now that’s magic! For more magical fun, join the museum for Harry Potter themed events at Fort Fun on Sunday, November 21st from 1:00 to 4:00 PM, and at the Fort Collins Museum & Discovery Science Center from 11:00 AM to 2:00 PM on Saturday, November 27th. Come and join us for Butterbeer, Harry Potter-themed Starlab presentations, the Owls of Harry Potter and courses in Wizardology. More information on our website. Last year we helped prepare you for Halloween by scientifically showing that a pillowcase is the optimal collection vessel for maximum candy acquiring. This year? It’s all about developing a candy-specific strategy. Hershey’s conducted a national survey to find out of correlations could be drawn between the types of houses people visit during Halloween, and the types of candy they get. The results? Visit a house with black shutters and you’re 77% more likely to get a Kit Kat. Stop by a ranch house, and those odds drop to 32%. If a Reese’s Peanut Butter Cup is more your style, you’ll want to be sure to visit two-story houses; they’re 26% more likely to have that candy than the ranch house that will probably give you the Kit Kat will. And finally, if all you want is a chocolate bar, try houses with brown doors. Whether or not people are matching their candy to their doors is still unknown, but it is known that you’re 32% more likely to get a Hershey’s bar than if you go to a house with a non-brown door. Now, this study only look at Hershey’s brand candies, so the data is incomplete. What we need is a big-scale, repeatable experiment that compares multiple candy and housing variables. Its a big (and yummy) job, but someone has to do it. Now, who’s with me?! The week holds a plethora of sky gazing opportunities. First off, Saturday, September 18th will debut the very first International Observe the Moon Night. 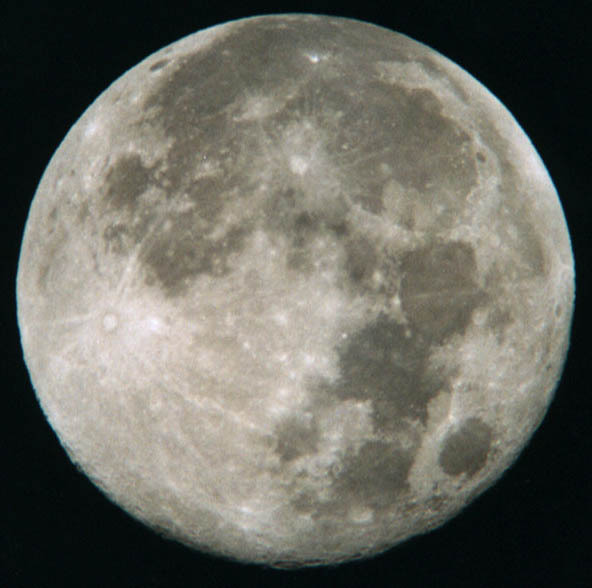 The evening is an offshoot of many programs that exist to explore and study Earth’s closest neighbor, including the very successful Lunar Reconnaissance Orbiter which has been sending back detailed images of the lunar surface. The moon will be in its waxing gibbous phase on Saturday, moving from a quarter to a full moon by Thursday, the 23rd of September. As the moon moves through its phases, there will be a few objects competing for your attention in the night sky. Monday evening, September 20th and Tuesday morning, September 21st, will see Jupiter at its closest proximity to Earth in over 40 years. This will make Jupiter the second brightest object in the night sky after the moon. Jupiter will be visible throughout the evening, appearing almost directly overhead at midnight. As you’re looking for Jupiter you may also be able to see Uranus just above the giant planet. Unlike Jupiter, which is visible to the unaided eye, you’ll need a good pair of binoculars or a telescope to make out the tiny blue green Uranus. If staying up until midnight isn’t your cup of tea, there’s also the chance for some early morning observations over the next few days with Mercury appearing low in the eastern sky about an hour before sunrise. The best days for viewing Mercury will be September 18, 19, & 20th. While Mercury will look like a pinkish colored light to the naked eye, a telescope may allow you to see the planet pass through a quick change of phases similar to those of our much slower moving moon. Don’t worry if you don’t have your own telescope, because on Friday, September 24th, The Fort Collins Museum & Discovery Science Center, along with the Astronomy Department of Front Range Community College, will host the Star Nights program at the Stargazer Observatory. The event runs from 8:00 to 10:00 PM on Friday evening and will include the StarLab Planetarium program, access to the telescope at the Stargazer Observatory, and other hands-on activities. The program is offered free to the public, although registration is required due to limited availability. To make a reservation, please contact Toby Swaford at 970-416-2705, extension 2. Whew! All the excitement from Saturday’s groundbreaking ceremony for the new Fort Collins Discovery Museum means that everyone in the museum still has architecture on the brain. While the architecture we’re thinking about at the moment is on the big we’re-building-a-whole-new-museum scale, there’s nothing to stop you from doing a little designing of your own. 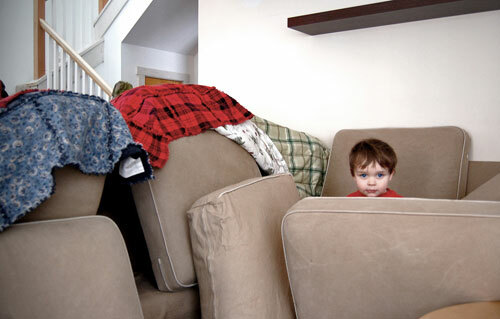 I’m talking, of course, about couch cushion forts! The team at Build Blog has compiled a two-part critique (Part 1, Part 2) of the various couch cushion architectural approaches. Did you know the importance of counter weights and Euclidian geometry, even when working with building materials of the pillow variety? What are some of your fort-building successes? Were you a purist, only using the materials that came from a sofa, or were boxes, blankets, folding tables and family pets all fair game as construction materials? My triumph involved a refrigerator box, wallpaper samples, and a lot of finger paint. It’s probably best I wasn’t allowed anywhere near an actual couch. We’ve had many new museum updates to share over the past year, but this Saturday is our biggest one yet: we’re breaking ground on the new museum, and you’re invited! Where: The site of the new museum, at the corner of Mason St. and Cherry St.
Family activities for all ages are scheduled from 2:00-3:30, and include clay brick making, architectural food structures, solar cookies and homemade root beer. The Colorado State University Color Guard will post the colors at 3:15, follwed by the Official Children’s Groundbreaking at 3:30. The first 1,000 children will receive a commemorative Fort Collins Discovery Museum Groundbreaking shovel! Following a short presentation, the Dignitaries’ Groundbreaking will begin at 4:15. All members of the press are invited to attend a press conference at 4:30. Festivities will conclude at 5:00 with a presentation by Colorado State University Native Drum Group, Ram Nation. We are so proud to belong to a community that has been supportive and encouraging about this project, and is as excited as we are to watch it become a reality. 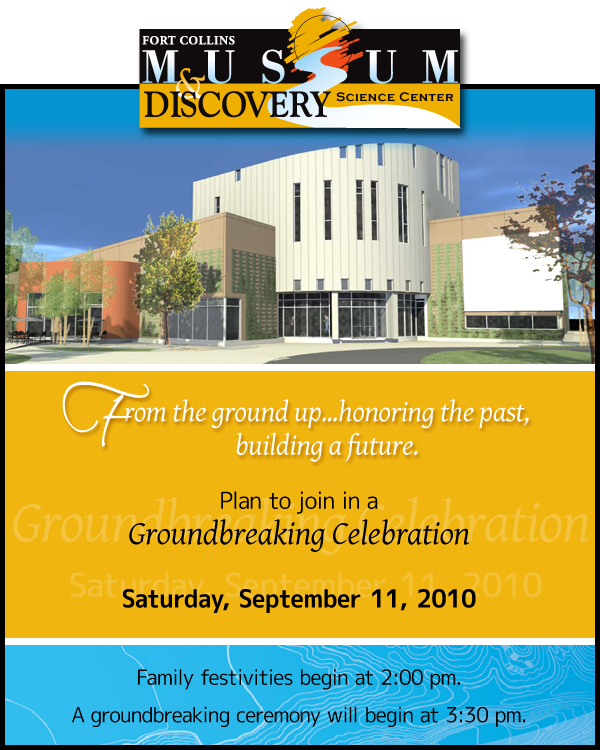 We hope you can all join us in celebrating this next big step in creating the new Fort Collins Discovery Museum.